Teeth Whitening, Teeth Bleaching. Z Dental Group - Beverly Hills Dentist, Los Angeles Dentist. Z Dental Group Dentists offer two whitening options: in-office ZOOM Whitening with immediate results in one hour and Whitening For Life Program. 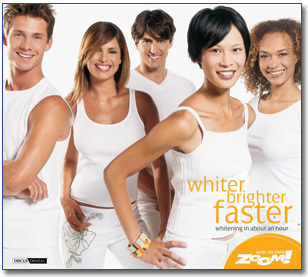 Zoom Whitening is one of the best whitening procedures available today to Dentists. It can only be performed by a trained professional and in a dental office. 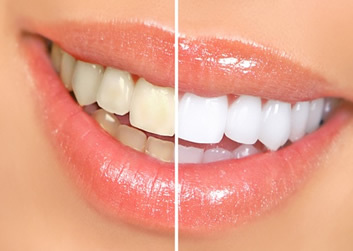 Within an hour your teeth can be whitened up to twelve shades brighter (on average eight shades) with the use of the most advanced, patented, in-office laser whitening devices. Z Dental Group offers Whitening For Life Program which is a take-home, custom made whitening kit. The kit includes whitening tray that is individually made to fit the patient's teeth and a whitening gel. The patient's teeth and gums will be examined thoroughly and checked for any dental issues. If qualified the patient will be offered to participate Whitening For Life Program after paying an enrollment fee of only $250.00 and signing the Whitening For Life Program contract. Then, every four months, when the patient visits us for a preventive check up, we will provide a free kit of whitening gel. This will help to keep your teeth white and guarantee a stunning smile for life! The only requirement is that the patient follows through with the procedure and visits us for a checkup and preventative care every four months.